We all dream of sinking that winning put at the Open on the 18th green, on the final day. Yet only the young and highly dedicated among us have a chance of that scenario becoming a reality. Most club golfers simply strive for incremental improvement, and teaching techniques should reflect this difference. Whatever your current handicap is, professional golf tuition, customized to your existing swing, your time availability, and your physical capabilities, can greatly improve your game. The thousands of great instructional videos that can be found on Youtube and elsewhere show how to build a classical golf swing. Yet as individuals, especially for established golfers, we all have habits and practices that we've have fallen into that cannot be simply forgotten about. For most club golfers, the best approach is not to try building a new swing based on current best practices for tour professionals, but instead to tweak what is already good about your game. 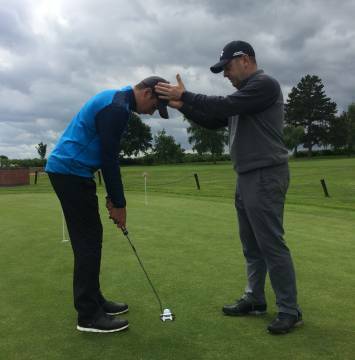 Craig Morris, Retford's Head Professional, evangelizes this individual approach and has unparalleled experience in improving the game of club golfers. Craig has been a fully qualified PGA Professional for twenty-two years, and has been at Retford for eighteen of those years. In that time, Craig has worked with a huge variety of golfers ranging from absolute beginners to scratch players, and from teenagers (through his work with the Balby Academy of Sport) to golfers in their retirement years. Every golfer can improve their game through tweaking and fine tuning what they already have. For details, prices, or just a chat, call Craig on 01777 703733, or visit the Pro's Shop.